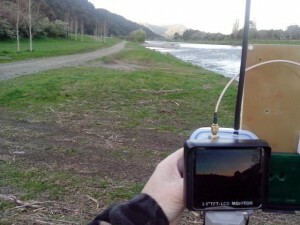 These notes apply to 2.4G and 5.8G CP (circular polarized) antennas commonly used for FPV video. These designs can also be used with 2.4G RC to increase range and/or reliability. Based on the Helical by IBCrazy info from RC Groups. For Airwave channel 4 on 2468 MHz using a light weight plastic cross support. Coil wire: thicker is better. Number of turns: 3 to 8 is a good range. There are various matching options. I have used the wave-trap on 5.8 GHz with success. Based on the Clover Leaf by IBCrazy info from RC Groups. For Airwave channel 4 on 2468 MHz using a small double-sided PCB disc to attach coax and wires. RH-CP is when the elements go up to the right. LH-CP is when the elements go up to the left. Based on the Skew-Planar by IBCrazy info from RC Groups. September-23-2013. Late afternoon I did a 2.4G FPV range test at the Hutt River. It’s over 2 years since I’ve seriously flown 2.4G FPV. With a camera, 10mW transmitter and battery on a stake and the cloverleaf antenna about 1.2M AGL, we wandered off with the receivers, antennas and small monitor. I was comparing a 2.4G skew planar (CP) and the quad patch (linear) I built a few years ago. Skew Planar and patch are probably not the best match, but I haven’t made the helical yet. The patch worked best when lying on one side; linear horizontal polarization. Except for drop-outs when bushes got in the way, the image was good on the skew-planar out to 700 meters. Trees blocked the view from there to 1300 meters where it was just working and very noisy. The patch worked out to 1500 meters, where we ran out of easy LOS and gave up. There was some video interference on both antennas but I’m pretty sure it was coming from our cell phones which both had wifi enabled. From this I’d expect the tiny 10mW transmitter to be flyable out to at least 1KM in an area of little 2.4G noise, and 2 or 3 KM with a Helical receive antenna. This test was along the river bed. With the VTX say 15 meters up it should be much better. It shows how the guys in Europe go 10+ KM on 2.4G with 500mW or so. Antennas make all the difference. 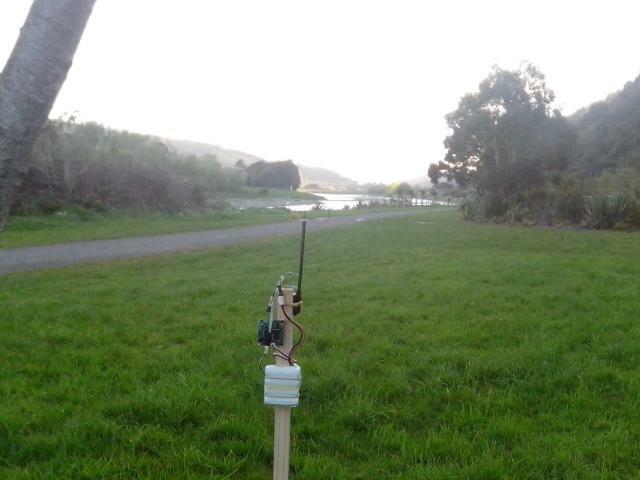 I got home and was looking at the results when I realized the transmitter was still operating on the stake at the river, and had to go get it.